It's the new year. We're one week in and I'm still getting my footing. The bang of fireworks at midnight seven days ago acted as my starter's pistol - the get-go for the clipping pace the days have taken. I don't know if I can still wish you a happy year, there must be an expiry date on the phrase, just as I don't know if I should be this bouncy over a January salad. But I am. 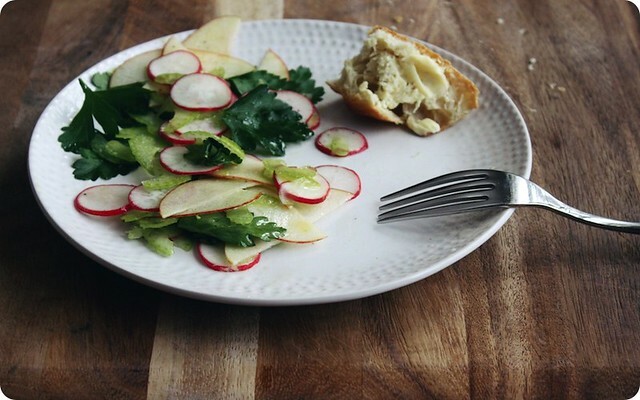 Smitten with radishes and celery and apple. And I do wish you grand times ahead. What started me on salads was when we slipped away to Montreal way back in November - even though their first snow had fallen and our cheeks were rusty with the bite of a sharp wind, leafy, green and perky salads were often the unexpected boon at mealtimes. Some peppery, some mild, with shaved fennel and Grana Padano, or a humble jumble of tiny greens in a film of dressing with pickled shallot. In the morning, served with our eggs, there were last September's tomatoes dried and preserved in oil. The last night was one where the sidewalks were slick with ice and I (firmly) held a gentlemanly arm to maintain my footing. Finally tucked into the warm restaurant, I was playing that game where you scout the menu by taking inventory of the plates of others when I saw a salad - a tangle of mixed cabbages and carrot, nothing more than a coleslaw really - and it was, somehow, exactly what I wanted. It made sense, really, that in the winter we need some crunch to enliven both our palate and spirits. It is no news that I am a fan of comfort food; braises and slow roasts are often my favourite meals. Against those rich, unctuous gravies and stews a salad brings all that the dish is not - the piquancy of vinegar and punch of freshness resets the taste buds and brightens the meal through contrast. Each becomes essential in the enjoyment of the other. And while we might not think of it, cold winters, those bitterly frosty days, are dry. Skin is chapped, lips are chapped, hair is flyaway and frizzy. I find myself, a person not usually one to keep a carafe by the bed, stumbling awkwardly and squintingly into the kitchen to gulp down glasses of water in the morning. A salad gives a meal an aspect of watery crunch, which is to say it refreshes without the stumbling and the stubbed toes. The salad we have here is a more recent entry into our canon, inspired by the collected lessons of our trip. I'll offer it up in terms as one should offer to a friend, without quantities or much by way of specification. The salad is best because of its combination. There is a balance of the different sorts of crispness between the supple celery and the assertive radish; the apple falls between the two. My only true instruction is to slice everything, save the parsley of course, as thinly as you can muster. Shaved wafer thin is where I'd aim, as the textures and flavours seem at their best as such, with it all coming off as ravishingly addicting. Wet, but not sodden, and that sounds funny I know. With baguette and butter it makes for an ideal lunch, only gaining in appeal when eaten indoors, at the table, by the window, with a snowy landscape on the other side. 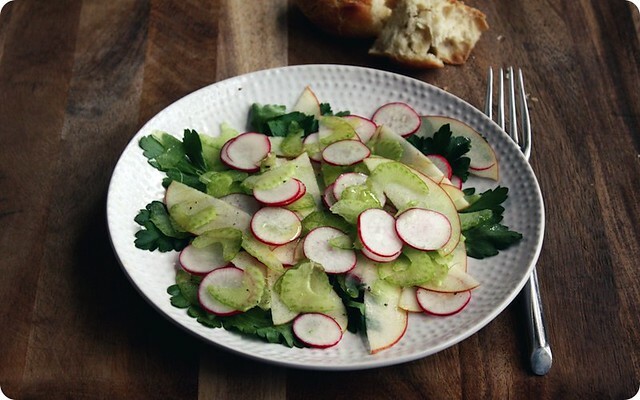 In a medium bowl, toss together the radishes, apple, celery and parsley. Squeeze over a bit of lemon juice, a fine drizzle of honey, and a larger splash of olive oil. Toss gently, so that everything is well coated, then add a sprinkle of sea salt and a good grind of pepper. Toss again and taste for seasoning.